The WellnessPro® is an electrical stimulation device indicated for the relief of chronic, intractable pain and as an adjunctive treatment of post-surgical or post-traumatic acute pain. The unit is compact, lightweight, and very user friendly. The WellnessPro® is FDA cleared and CE0459 marked as a Class II medical device. It has been laboratory tested against ISO and IEC standards to ensure protection, accuracy and precision. ​The unit has the most flexibility of use and largest frequency range in its class on the market today. It is digitally controlled with a unique “Deep Pulse IONTM” technology. Designed by world renowned scientists, the WellnessPro® has been created for the precise treatment to minimize the pain associated with various conditions. The WellnessPro® Plus electrotherapy device produces the FASTEST LONG TERM RESULTS by alleviating acute and chronic pain symptoms. It is widely used around the world and is the premier choice of health care professionals, athletes, coaches, and medical research facilities. WellnessPro® Plus impulses stimulate the peripheral nerves that send information about touch and vibration. The signals from the stimulated nerves interfere with pain signals traveling to the brain which reduces the brain’s perception of pain. In addition, the frequencies generated by the WellnessPro® stimulate endogenous opioids. These can eliminate pain through the same biological processes as prescription pain medications but without the harmful side effects. YES. The WellnessPro® has been FDA cleared as a TENS (Transcutaneous Electrical Nerve Stimulation) device and is the NEW drug free option for acute and chronic pain. Unlike other TENS devices, the WellnessPro® has a very large frequency range coupled with a unique delivery system which stimulates the body to block pain signals. The deep "R-wave" and "Deep Pulse" technologies send frequencies to the affected areas in a unique pattern, that trigger electrochemical processes, achieving long term, astonishing pain relief. The WellnessPro® has demonstrated superiority to other comparable devices by achieving longer term pain relief. The WellnessPro® allows more flexibility for users and practitioners. In addition to the TENS mode, the WellnessPro has microcurrent mode, which allows the unit to work with the body's electric current on a cellular level. It works within the mitochondria of the cell, increasing healing ATP production by 400% to 500%. It utilizes a unique combination of frequencies and waves to achieve fast pain relief in the most complicated cases. YES. If you are not a licensed medical practitioner and you wish to purchase the device for home use, a prescription is required in the US. Don't worry, your doctor or chiropractor will be happy to prescribe this safe and effective device. We will walk you through the process. If you are a licensed medical practitioner, proof of license must be provided. No prescription required if the individual lives outside the United States. 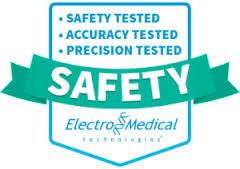 Additionally, if you do not wish to personally use the device and would like to become a sales representative for Electromedical Technologies, you can purchase a unit with distributor paperwork on file. The human body functions through electro-chemical processes. Currents flow through cells, connective tissues, muscles, ligaments, and bone by neurological pathways to the brain. When an injury occurs at a particular site, the “Electrical Grid” is disrupted causing the healthy current flow to change pathway conductivity. The WellnessPro Plus microcurrent (millionth of an amp) works with the body’s electric current on a cellular level. The unique sub-sensory micro currents increase the production of ATP, protein synthesis, oxygenation,ion exchange, absorption of nutrients, elimination of waste products and neutralizes the oscillating polarity of deficient cells. The WellnessPro Plus utilizes a unique combination of the largest range of frequencies and wavesto achieve fast pain relief in the most difficult cases.